Mr.S.I.R.Croos, a Civil Engineer was appointed as the 26th President of the Trincomalee Rotary Club Saturday night at an event held in Hotel Club Oceanic in Allesgarden Trincomalee. Mr.R. Renganathan, Deputy Chairman of Seylan Bank was the chief guest and the Trincomalee District Government Agent Mr. Gamini Rodrigo was the keynote speaker, according to sources who attended the event. Mr.Croos, native of Pesalai in Mannar district is the Director of Highway Research and Development, sources said. 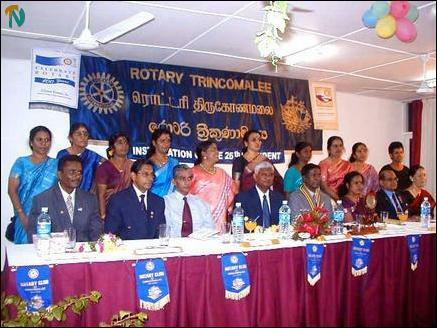 Trincomalee Rotary Club has been selected one of the three best clubs in the island for the year 2003 for its humanitarian projects such as providing low cost housing facilities to displaced families and pre-schools in resettled villages. The club also supplied books to students in schools in remote areas to improve the literacy among the villagers, nutritional food to pre-school children, clothing to poor families, medical camps in uncleared areas and self-employment to women, sources said. "Members in most clubs of this type, use the meetings generally to further their own business interests. 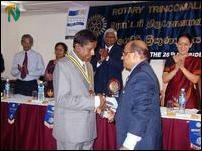 But Trincomalee Rotary Club is an exception," the chief guest Mr. Renganathan said speaking at the installation ceremony. Mr. Renganathan announced that his bank would donate one hundred thousand rupees to the Trincomalee Rotary Club for its humanitarian projects. He suggested that this money could be used for setting up a chemotherapy unit in the Trincomalee general hospital enabling treatment for cancer patients in their own district instead of travelling to Maharagama cancer hospital in the Western Province several hundred miles away from Trincomalee. Mr. Gamini Rodrigo gave the keynote address. 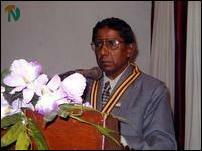 Mr.Croos, new President said, "Let us not become complacent with our successes and satisfaction we Rotarians of Trincomalee have cherished through our services to society in the past quarter century but vow to continue with much more vigor to help the people to enjoy better quality life." Mr.S.Jeyashankar, new Secretary of the club for the ensuing year proposed vote of thanks.